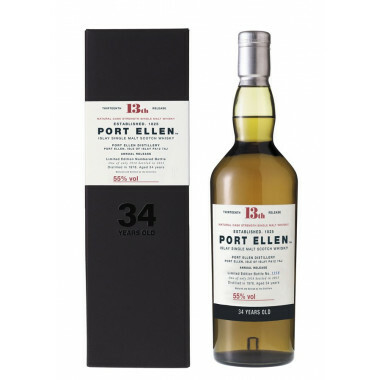 An astounding Port Ellen, of amazing strength and utterly compelling with its complexity and deep, heavy character. 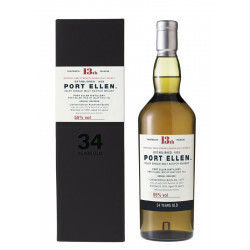 An astounding Port Ellen, of amazing strength and utterly compelling with its complexity and deep, heavy character. The subtle nose belies how lively and straightforward is the first hit with its stunning flavours - a wonderful marriage of citrus fruits, appealing smoke and salt, layered in honeyed sweetness. Couleur: pale amber, sun-bleached gold. Quite thick, suggesting the richness of its texture. Nose: understated, clean. Hints of black caramel wrapped in wood smoke, then refreshing eucalyptus oil with a touch of blackcurrant. The wood smoke gives way to flavoursome aromas, luscious, of smooth honey and roasted grains. With a drop of water, the hit is smoky with an undertone of lime in the oily texture. Palate: simply astounding. An intense, smooth smoke envelops the palate, followed with fresh lemon notes, lemon peel and butter. This smoky sweetness, rich and fruity, evolves onto a coating texture and mellow notes of dark chocolate, cradled into an exquisite wood smoke. Perfect tasted at cask strength. After a while in the glass, an honeyed and lemony mouthfeel sparkled with salt flower. After a drop of water, the mouth is silky, slightly oily, smoother and more accessible: the salt is still here, lifted by a spicy hint. Finish: long, coating, intense and lasting. Overflows with smoke. A touch of mint and bergamot, quite dense and flavoursome, marked with an aftertaste of cloves.